Everyone knows that the three key ingredients in French cuisine are butter, butter, and butter, but I would argue that there is a fourth. That secret is high quality ingredients. Real cream, quality cheese, fresh, in-season produce, and, of course, butter. 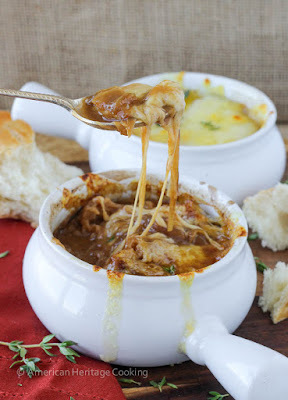 French Onion Soup, at its core, is a very simple soup. It is here that quality ingredients matter. If you want to turn a good soup into a tantalizing culinary experience, you need to start with homemade beef broth. I’m talkin’ roasted veal and beef bones simmering for hours. Try it. Then you’ll understand. You will want to make sure that your onions are deliciously caramelized. Almost more than you think is right. Even darker than the pictures in my initial post. They will smell sweet with a note of caramel, and should be a rich caramel brown.